Stick with me on this principle because it is deeper and higher than you would first think. I will do my best to explain what I captured. 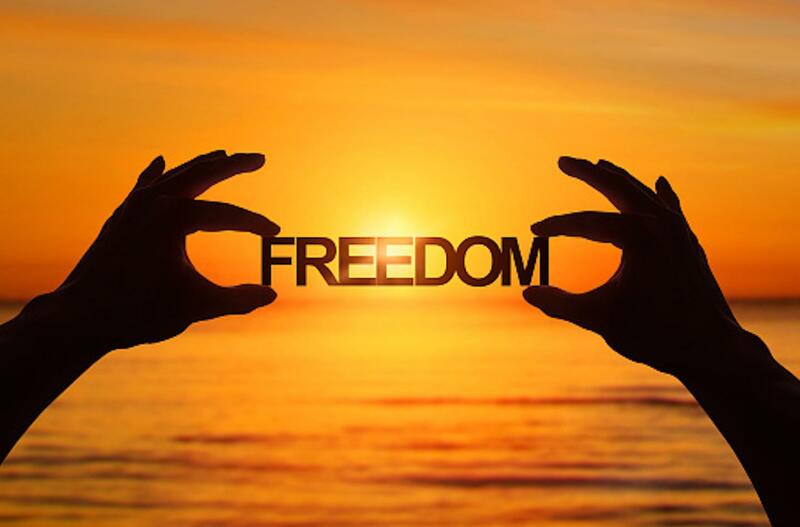 One would expect to hear that freedom is created when getting yourself out of debt. There is no doubt that debt in your life becomes an anchor that controls your every move. If your debt is not affecting you and your decisions, it is only because you decided to become callus. Let me explain. After graduating college (undergrad and grad school) and getting married in 1999, I had amassed $142,000 in student loans! Crazy, I know. I began to talk with everyone I knew about getting out of debt and the answer in return was “just get use to it”, “that is the way it is”, “you just move from debt to debt, so welcome to the real world”. I heard this so much that I stopped thinking about getting out of debt and just learned how to “get by”. I would pay the payment each month and that was it. I even added a mortgage and car loan on top of the student loans. Living day to day became my M.O. Never allowing myself to look at the big picture (because the big picture or big debt was overwhelming). This was truly hardening of my heart and mind to the possibility of freedom — I was becoming callus to it all. Now, if you are at this point in your life, I understand. You need to let a program like the Financial Fitness Program into your life. You need to learn the basics and application of the Offense, Defense, and Playing Field of finances. It will have generational impact as it has with me. Worst case scenario, you can be financially secure. But what I learned from Orrin this summer, was on the far other side of financial freedom. I watched a man who’s income is very public with the Income Disclosure Sheet of the Life Company, begin to answer, ” what legacies can I help and create to serve my fellow man?” He and his beautiful wife, Laurie, decided that their current properties and lifestyle had fulfilled many of their dreams, and now it is time to help this world be better. What would it be like to say that you have been so blessed in so many ways that it is now your turn to bless. That God gave us time and finances to serve so let’s spend them in a worthy cause. I know we all have a soft spot for some cause, big or small. How would you dent this world if you could. I watched them dig deep into ONELife for Life. A mission that is out of Flint, Michigan and lead by Pastor Eric Stewart. Its focus is to help bring babies to full term. The mission had determined that a large number of babies lives were being terminated due to financial strain of the mother or father. Isn’t that crazy! Our finances can control life and death! It makes my heart hurt just thinking about it. Pastor Stewart and his church, ONELife, started filling the need for caring and finances for the mothers and the babies. Orrin raised his hand and said that he is all in by becoming a main benefactor to the mission. He also speaks out of the work that ONELife for Life does and uses his influence to attract more help. What would it be like to be able to use your time, money, and influence for a cause the you personally find dear to your heart? I watched Orrin assist a friend that was going through a very difficult moment in his life. Orrin choose to be the “good Samaritan ” both spiritually and financially. The situation required nothing of Orrin except loss, but he choose to help take on the burden. Orrin did not weigh the loss verse gain financially. He only knew that his friend might break completely in the moment, so how could he just sit by and watch. Wow! What would you do if you could serve even when it wasn’t warranted or deserved? What could be your impact? The principles of “service over money” and “impact over bottom line” became so evident to me this summer. I watched with my own eyes as these principles came into fruition. Orrin was able to completely put the financial question “how much can I spend” out of the equation. He was in for the impact on those God had placed before him. I observed him display what Paul says in Philippians “learned to be content “. Orrin was content to give freely and completely. He needed no other reason than “this is what we are called to do”. We all so desperately need those like Orrin in our life. We need to watch their coming and going. We need to see their actions. See the good that they are doing and realize it is not for show. Their deeds make us stronger and create a desire in us to be better for Kingdom causes. Get yourself an Orrin because they are out there right now serving people. Steel the Mind, Tender the Heart.